This is a very easy to make pattern for a Christmas stocking. 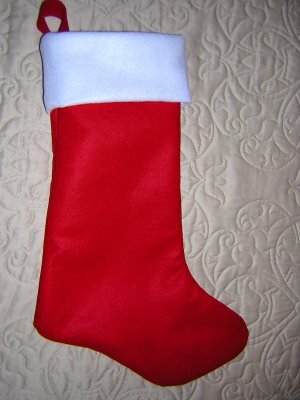 You will need red and white felt to make this stocking. Print out and tape the pattern pieces together. Cut out the pieces - you will need 2 of the red stocking part and just one of the cuff. If you want to put any decorations on the stocking, you need to do it before you put the pieces together. 1. Sew Christmas stocking together, around the outside edges using a 1/2 inch seam. Turn stocking inside out then. 2. Sew the white piece together on the ends with a 1/2 inch seam and now you have a circle. 3. Fold loop in half and pin it to the inside of the stocking over the back seam. Then pin the white felt circle inside the stocking. You will be able to fit it in as you can stretch the red felt. Sew a 1/2 inch seam. 4. Turn the white felt to the outside. Now you have a Christmas stocking! Copyright 2015 FreeApplique. You may create finished products to sell or for personal use.